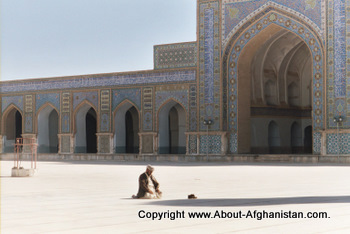 People today may think that Afghanistan has mainly known Islam as the most influential Afghanistan religion. However, all of the world's major religions have made their mark in the area known in the modern time as Afghanistan. Christianity, Judaism, Hinduism, Buddhism, and Islam have each made their mark in various parts and times in the past thousands of years. At present, the main religion is Islam. Surprisingly, there is still a Sikh Temple and one Hindu Temple in Kabul. The Italian Embassy has an official Catholic presence. And up until recently, the last known Jew was still living in Sharenau, Kabul. The Afghan Constitution guarantees religious freedom. Chapter 1, Article 7 "...The state shall observe the Charter of the United Nations, international treaties, international conventions that Afghanistan is a part to, and the Universal Declaration of Human Rights." Chapter 1, Article 2 "...Followers of other religions are free to exercise their faith and perform their religious rites within the limits and provisions of the law." Religious freedom is the will of the nations of the earth. Concerning the Universal Declaration of Human Rights, UN Article 18 states: "Everyone has the right to freedom of thought, conscience and religion; this right includes freedom to change his or her belief, and freedom, either alone or in community with others, and in public or in private, to manifest his religion or belief, teaching, practice, worship, and observance. The history of Afghanistan is intertwined with the history of the religions making their mark. Here we offer a concise foundation of knowledge of religions, relevant to the average person beginning to live here. Take this quiz to see how much you know!